We recently celebrated a successful first year delivering the Social Investment Fund ‘Work IT’ Programme with Executive Office Junior Ministers, Megan Fearon and Alastair Ross, our lead partner, Newry, Mourne and Down District Council, programme participants, local employers and representatives from community groups. Seamus McCabe from PIPS Newry and Mourne spoke on the day about how the Work IT programme has benefited them commenting that “it came at the right time for our organisation; we were able to invest time into staff’. Work IT participants Eamon and Shane completed work placements with PIPS while also gaining accredited qualifications in advanced Photoshop and First Aid as well as a Level 3 CIEH in Education and Training. Both have since be offered full time employment with PIPS Newry and Mourne; Eamon as Fundraising Coordinator and Shane as a Community Development Officer. Steven Lavery from the Bushcraft Centre also spoke about the Work IT participants they have on work placement at their centre. Gavin and Matthew, aged 17, are excelling and making the most of the opportunity to gain experience in ground maintenance, facilitating group work activities as well as looking after the livestock. Work IT participant Joanne Shortal was offered a job with Drumbeg Residents Association after completing her work placement. Drumbeg Residents Association, which once faced closure, has now become a Community Hub which is buzzing with activity. Drumbeg Residents Association also availed of Work IT support for a number of community projects including fun days, arts and crafts and Christmas events. Joanne has even started a new training initiative within the community called Drumbeg Learning and Development, encouraging learning and training among the young residents. She certainly has a passion for the community of Drumbeg and states that the “Work IT Programme gave me the opportunity really make a difference in my Community”. Junior Minister, Megan Fearon said: “Getting people into jobs is no easy task but the Work IT project has proven to be a real success. The project is delivering for local people and this investment is really making a difference. Already it has worked with over 550 people and delivered 160 full time placements. As a result, 80 people are now employed. Carla Campbell, Work IT Programme Manager added “Working on the ground with the local community we can see the real difference we are making through Work IT, people are embracing the opportunity to develop their skills and improve their chances of finding work”. 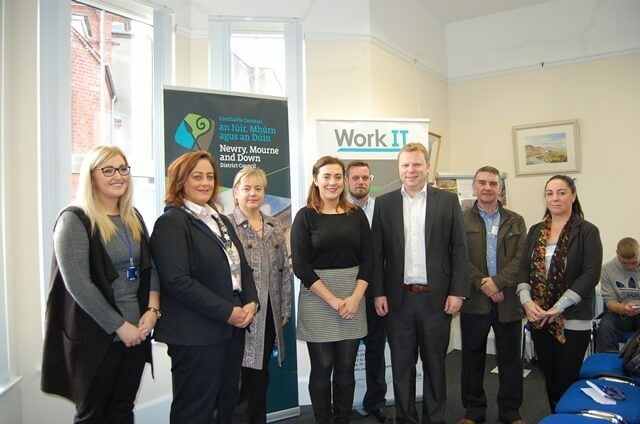 The Southern Zone ‘Work IT’ project is funded by the Northern Ireland Executive Social Investment Fund (SIF) Programme which aims to make life better for people living in deprived areas by reducing poverty, unemployment and physical deterioration.